It will explore everything from his upbringing in Queensbridge to the infamous "Malice at the Palace"
Ron Artest, also known as Metta World Peace, played 16 years in the NBA between 1999 and 2017, with six NBA teams as well as stints with clubs in China and Italy. Known as one of the top defenders in the league, Artest/World Peace won a championship with the Lakers in 2010. He was also the focal point of one of the most notorious brawls in league history. 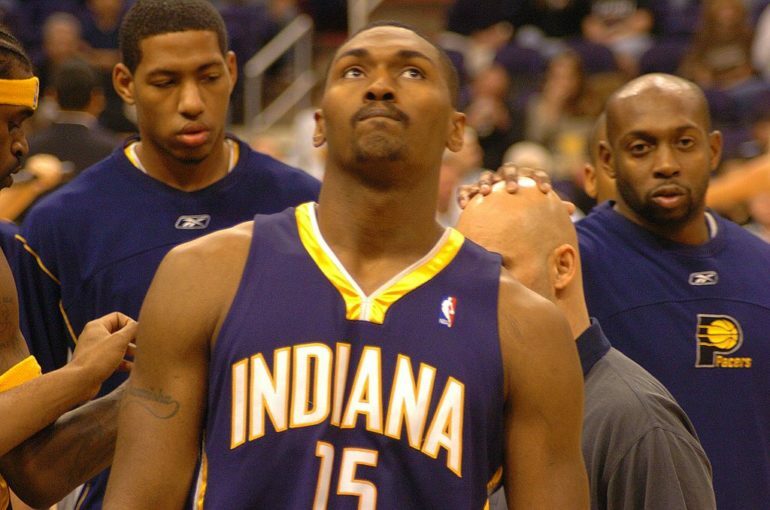 Now, Artest will be the subject of a movie. Quiet Storm: The Ron Artest Story, a documentary about the former NBA star, will debut on Showtime May 31, Deadline reported this week. The sports website Bleacher Report produced the doc, which was directed by Johnny Sweet. “From Ron’s challenging upbringing in Queensbridge among some of the biggest burgeoning names in hip-hop through his transformation to Metta World Peace, Metta has been best known for his fierce competitiveness and unwavering loyalty,” Showtime’s Stephen Espinoza said in the announcement. The showing will take place in conjunction with Mental Health Awareness Month, as Artest has experienced mental health struggles throughout his life. The player famously took part in the brawl between his then-team, the Indiana Pacers, and the Detroit Pistons on November 19, 2004. The brawl, which has become known as the Malice at the Palace, started when Artest was hit with a hard foul by Detroit’s Ben Wallace. Following a brief scuffle, a fan threw a drink at Artest, who then charged into the stands for several minutes. According to Sports Illustrated, the documentary will show “full footage” of the infamous brawl, as well as interviews with various people who were involved. After the incident, Artest was suspended for the remainder of that season, costing him over $5 million in salary; he was also sentenced to community service. He returned to Indiana the following year but was eventually traded to the Sacramento Kings. In his long career, Artest played for the Chicago Bulls, Houston Rockets, the Los Angeles Lakers, his hometown team the New York Knicks, the Sichuan Blue Whales in China, and Pallacanestro Cantu in Italy. Artest finished his career by returning to the Lakers, and now works as a coach with the South Bay Lakers, the team’s G League affiliate. Prior to the 2011 season, the player had his name legally changed to Metta World Peace, and he played under that moniker for the remainder of his career. He is referred to as “Ron Artest” in the title of the documentary, however.